Negative Nimbus is a cloud with a sad disposition. Why is he so sad? We’re not sure, but it might have something to do with being fairly unable to control his rain. As you play through the levels in this delightful game from CloudKid, an animation studio with credits that include PBS Kids, you’ll earn up to three stars per level, hats to adorn your puffy dome, and comics that might just explain the story better. I couldn’t get them to download, but the app *just* came out, so I’ll let them slide on this one. CloudKid consists of Dave Schlafman and Matt Moore, who met at the Massachusetts College of Art way back in the dark ages of 2001. Matt graduated to Los Angeles, and Dave stayed in Boston until 2009 when they reunited as CloudKid. Since then, they’ve created a string of successful kid-focused animation projects, including the Between the Lions animated series with WGBH and PBS Kids. They also co-produce Fizzy’s Lunch Lab, an animated show about cooking, nutrition and health for kids that airs on PBS. 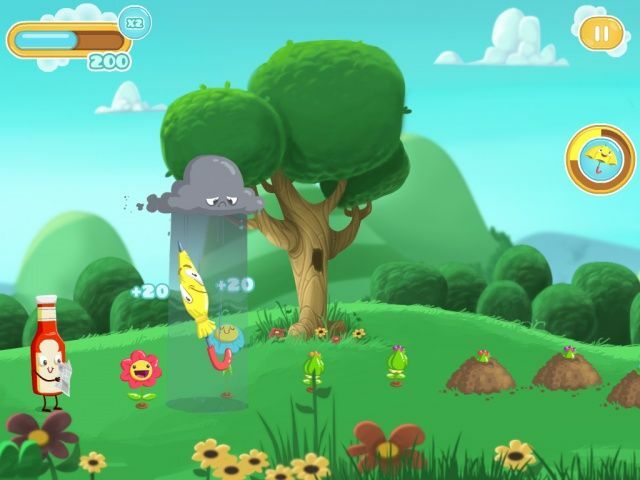 Negative Nimbus is their first iOS game, and while it’s clearly aimed at the kid demographic, it’s a ton of fun to look at, listen to, and play. And? It’s only $0.99. Win! Give it a try and let us know what you think in the comments, below.